High in the Himalayas sits Bhutan, a small country defined by towering mountains, lush forests, and flowing rivers, and home to endemic species such as the snow leopard, tiger, golden langur, takin, and black-necked crane. 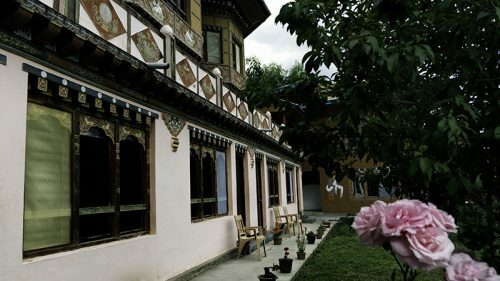 The country’s unique and well-known philosophy of Gross National Happiness integrates governance with rich cultural traditions, Buddhist principles, and environmental conservation. Explore the rich culture, biodiversity, and dramatic mountain views of the Bhutanese Himalayas. Spend six weeks surveying forests, visiting ancient shrines, and studying issues of conservation and development in one of the most fascinating countries in the world. Wrap up the summer by designing and conducting a group research project. Each delicate painting on the wall of a dzong, each colorful flower dotting the landscape – we beg our minds to absorb each detail and memorize each intricacy, we cannot get enough of the magical world around us. In collaboration with our in-country partners, UWICER and BES, research at the SFS Center for Himalayan Environmental and Development Studies focuses on enhancing the condition of forest, river, and mountain ecosystems while balancing modernization and cultural preservation. Students contribute to this collaborative research agenda in several priority areas including sustainable forestry, conservation biology, water resources, socioeconomics, human well-being, and policy. Climate change is severely impacting Bhutan—extreme weather events, landslides, flash floods, and glacial lake outburst floods are threatening people and ecosystems. SFS students learn about environmental policies and laws and mitigation strategies for dealing with climate change. Students also have the opportunity to discuss the topic with policymakers and planners at the national and local level. We study how government authorities build awareness on the importance of biodiversity conservation at both national and local levels and also enforce laws to conserve the country’s rich biodiversity. Students are taught about the topic in classroom lectures by faculty and guest speakers. Students also have opportunity to conduct research projects related to biodiversity conservation issues. Because most Bhutanese reside in rural areas and practice small-scale agriculture and forest product extraction, sustainable natural resource management is critical for achieving the country’s holistic development goals. Students conduct both social and biophysical research on natural resources and water management regimes and issues. We study community forest management and the opportunity it provides to improve local livelihoods. Enshrined in the country’s constitution is the concept of Gross National Happiness (GNH). This has four pillars—sustainable socioeconomic development, preservation and promotion of culture, conservation of environment, and good governance—all oriented toward producing sustainable livelihoods rather than unsustainable consumption. Students study GNH and how Bhutan’s development policy addresses issues like food security, poverty reduction, cultural preservation, and sustainability. SFS is an active part of the Bhutanese community. During the program, students participate in a short homestay, join community volunteer projects like stream clean-ups and teaching environmental awareness in local schools, attend tsechus (festivals), and play sports with Bhutanese students and monks. SFS research data is made available to the local community and Bhutanese government.